Modern day sports fans have evolved over time. While their ardour for their favourite sport continues to be as strong as ever -- on match days, one would still find hundreds of eager fans waiting patiently for hours on end in unending queues outside the stadium gates to get in; or tense faces before TV screens, watching with bated breaths and praying hard for their favourite team's success; or fans painting their faces blue, yellow, green or purple or whatever as per their team's colours and rooting for them; and so on --, it’s the way they now consume sports that has evolved. We have now entered an era of active fandom. Sports fans now love analyzing players and games and have insights and opinions of their own. They are no more content in being mere spectators or enthusiasts, instead, they are now more keen to be a part of the sporting action, to engage with their favourite teams and players more deeply. This desire to play a more participative role is what has driven the fans to engage with fantasy leagues. What is a Fantasy League and How does it work? For the uninitiated, a Fantasy League is a virtual platform that allows sports fans to act as owners of their own sports teams! They can create their own imaginary teams by selecting real players (who they think would perform better than the others) from both the competing teams scheduled to play in a particular league or an official match and earn points based on how the selected players in their fantasy team perform in the actual match. After the match gets over, points are calculated and the users can then compare their performance with that of other players in the fantasy league. The fantasy team that earns the highest points wins the Fantasy League tournament. Why have Fantasy Leagues become so popular? What started off as a fun activity -- beating friends and colleagues in a Fantasy League to win bragging rights about one's sporting prowess and knowledge -- has, in the recent years, gained much traction among the sports fans, especially the younger ones. Not just for the rewards that come in form of cash prizes or bonuses that one can earn, but because fantasy leagues enable a fan to play the role of the all-important manager instead of being just a match viewer, allowing him to select his team members based on collated and analysed statistical information. In essence, the users are able to engage more deeply with the sport they love. Thus in a way, fantasy leagues come across as being more inclusive. No wonder, Fantasy Leagues have become such a rage the world over. They are becoming popular in India too. For instance, Dream11, the leading fantasy league platform in India, currently has over 20 million users. Apart from cricket, Dream11 also offers its users the chance to select their fantasy teams in other professional sports too like football, basketball and kabaddi. Click here to play the matches of your choice. And not just for the matches happening in India, the users can participate in matches of these sports happening all around the world. Thus it has provided sports aficionados in India a platform to showcase their knowledge and awareness about the game and get rewarded for their expertise. Apart from that, they can also compete with other users based on the points they earn and have a shot at the crowning glory - winning the Fantasy League tournament. Of course, competing in a Fantasy League requires considerable skills and strategy, and depends on one's knowledge about the game as well as some luck to select a perfect team. So sometimes it does get tricky. But it sure is fun and exciting. More than anything, Fantasy Leagues have transformed the way how the fans engage with their favourite sport. In fact, participating in a Fantasy League makes watching the real match even more exciting for them as it makes them feel a sense of having some skin in the game. 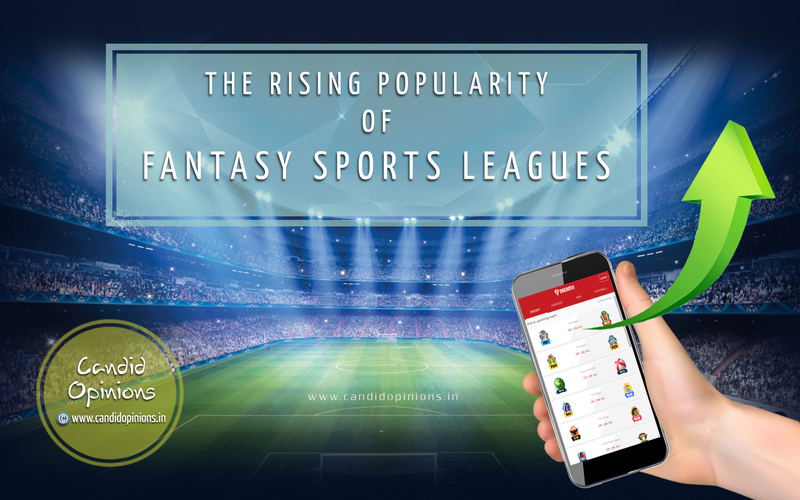 Thus fantasy leagues have not only increased sports consumption but have also turned casual viewers into avid sports fans! Indeed in the last couple of years, the frenzy for fantasy sports has increased immensely specially among the youngsters. And they are quite interesting and enjoyable too. @Kumar Alok, That's true. The youngsters are absolutely crazy about fantasy leagues, especially about Dream11. What a heart-piercing title track!